If you’ve been around me much you may know of my affection for the Book of Sirach, sometimes called Ecclesiasticus, an apocryphal book not always included in English translations of the Hebrew and Christian scriptures. It’s a very practical book of wisdom, one ancient mind’s interpretation of Hebrew Law and faith for those outside of Israel or those within who wish to study deeper into God’s instruction. As we move into 2017 this can become a worthy intention for us all, especially in this day of social media and internet driven false-news. When inflammatory things are said of anyone, give the benefit of the doubt. This is a faithful and graceful practice for our immediate neighbors as well as those in public office and service. Can you relate to the metaphor of a fool hearing some juicy gossip and suffering birth pangs until it’s repeated? I can. I believe 2017 needs just a bit more chilling out and listening and a lot less freaking out and screaming from me and from you, from all of us. Because, as this ancient writer reminds us, we can all make mistakes, often without even realizing it. This entry was posted in Devotional Thoughts, Just Life, Scriptures and tagged Gossip, grace, wisdom. I’m just having some morning coffee, meditating on the day and thinking of all the discord in our country with the presidential debates and fighting, the violence in our streets and wars around the globe… leads me to pray for our species. Today, I will speak with more civility, express myself with more genuine love and welcome for others, and I will speak and act to impart dignity to all people, especially those least like me or least liking me. And of course, our prayers often begin to be answered in our own lives, in our words and actions. If we’re going to ask God to increase peace in the world, then we are rightly reminded to acknowledge that we will have to be part of the increase. It begins with our hearts and the overflow of our hearts into the things we say and things we do. How can you increase peace in the world, today? Is there a personal conflict with someone you can resolve? Is there a good greeting to practice giving others? Is there a need you can meet? Is there a friendship to renew or develop? The day is ours, a gift of God. Let’s begin it well, seek the best that we can achieve in it, and in the last give all thanks to God. This entry was posted in Devotional Thoughts and tagged Civility, grace. 22 All this took place to fulfill what the Lord had said through the prophet: 23 “The virgin will conceive and give birth to a son, and they will call him Immanuel” (which means “God with us”). 24 When Joseph woke up, he did what the angel of the Lord had commanded him and took Mary home as his wife. 25 But he had no union with her until she gave birth to a son. And he gave him the name Jesus. Matthew stands alone as the Gospel writer giving us the story of the annunciation to Joseph, something we usually associate with Mary (and which we’ll see in Luke’s Gospel). Joseph stands in a similar situation to Mary in that his marriage plans and future marital hopes seem to be coming apart at the seems… his betrothed has turned up pregnant. He would be understandably upset, angry and hurt. He would understandably feel betrayed, and most of us would lash out at Mary in our hurt and anger. But Joseph is a good man, a righteous man, and that leads him to grace instead of disgrace in his dealing with Mary. He’s a righteous man. The Greek word there means that Joseph is a keeper of law, both human and divine, and is as he ought to be. And that leads him not to judge or to disgrace Mary, but to move in a way that protects her from any further hurt or harm. The circumstances look about as bad as they could be for Mary and as hurtful as they could be for Joseph. She’s not yet fully married, but now unexpectedly pregnant, and Joseph moves to shield her from further trouble. When it says that Joseph did not want to expose Mary to public disgrace the word in the Greek does mean to put on display. Isn’t that what we so often do to deflect any blame or wrong-doing that might be accredited to us? Isn’t this what we do to punish people when they hurt us? We usually make sure everyone knows who deserves disgrace and blame. Joseph shows us a better way, a way of grace. Still, Joseph does plan to divorce her, right? He does plan to end their betrothal. I’m glad he is a righteous man and plans to do so quietly, but I’m even happier that God steps in and expands on the grace Joseph would show Mary. When God enters the picture Joseph is called to greater faith and less fear. He is called to courageously embrace the very circumstances which had caused him pain and embarrassment, and to love Mary without fear. This Advent Season let us remember that the arrival of Jesus is shrouded and immersed in grace, grace shared between people. Can we become a people who daily advent grace into our lives and communities? Oh, yes. We can choose to put aside a righteousness that demands others be judged and demeaned and choose a righteousness that honors others and protects them, even in the worst of circumstances. Choose grace. That is our Advent message for the week. Choose to look past the circumstances and be not afraid. Protect those around you, even if they seem to deserve worse than they are getting. and then watch you it into grow a beautiful thing! to those most in need of our best. This entry was posted in Advent, Devotional Thoughts, Prayer and tagged Advent, Advent Week Two, grace, Joseph, Matthew. It’s hard to say goodbye to someone who has been an integral part of the American experience for so many years, and yet someone the vast majority of us did not really know. Robin Williams was a comedic genius who gave us so many voices to enjoy. He could make us laugh with only a facial expression, but when he opened his mouth, and who knew what was going to come out, we would all be giddy and goofy with anticipation. What a soul! He will be missed in this life, and cherished and loved for his gifts. He was also a human being, and had all the flawed brokenness that is so endemic to our daily struggle. Like many others, he was not immune to depression because of money, fame or success. Probably the money, fame and success were some of the things that could exacerbate his depression. I’m not doctor, so I don’t speak from medical training. I’m just someone who has grappled with depression my entire life, and I can relate to the reality of the best times bringing on the worst. If you have asked, “How could he be depressed with all the money and fame?” then you’re probably not someone who has struggled with chronic depression. For you this could an opportunity to realize how difficult it has been for that friend or family member to deal with their depression. It defies logic. It is very real. It is not chosen. 1) Depression doesn’t separate you from God’s love. No one should assume that struggling with chronic depression is in any way necessarily an indicator that someone has rejected God, lost God’s love or is trying to live life without God. There is no scriptural basis for that kind of judgment or condemnation. 2) Depression is never bigger than God’s grace and love. That goes for anyone who attempts suicide, succeeds at suicide or is a survivor left by a loved one who commits suicide. To be reminded that God’s grace is bigger than suicide is not to say that suicide is ok. Suicide is painful, hurtful and devastating for the survivors. And yet, suicide also flows from some of the deepest pain and anguish that we carry as humans. As our hearts are moved and made raw by the anguish of suicide, can we believe that the heart of God is any less moved? There’s no scriptural basis for saying that suicide is an instant separation from God… that’s a traditional teaching that needs to be corrected. 3) Beware the isolation. I’m not speaking here specifically to Robin Williams’ experience, but in a broader sense… don’t go it alone. Chronic depression and the feelings of worthlessness, hopelessness and shame that it engenders will move you to separate yourself from others. Please don’t. Seek people. Start with a doctor who can help you determine if there’s a medical need that requires treatment, and get with a healing community… your friends, family, church, synagogue, temple, mosque, etc. 4) Don’t help isolate people who are depressed! Please, don’t turn away from someone who is struggling with a depression that you don’t understand. Help create a community of hope and healing where you live. Read, study and pray to be prepared to be a healing presence for someone in need. Be prepared to love and to help as much as someone will let you. 5) For my fellow followers of Christ, if a “Christian” blogger or group speaks of suicide in a judgmental, accusatory fashion, lacking the grace and love we expect from Jesus, then for the love of Jesus DO NOT SHARE THAT BLOGGER! Why is it that the worst opinions and perspectives I have seen on the death of Robin Williams have been from “Christian” groups? This is not as it should be, and the solution is ours to enact. I refuse to link to them and expand their influence by sharing their hate and/or ignorance, even to refute and disown their words. Please, please, please be discerning. If you’re up against that wall, when depression and it’s crippling grip have a hold, I’m yours. Email me, ok? We’ll chat. I’ll give ya my email, in code so the spammers can’t get in the way… it’s reserve7 @ gmail. com. Squish that together without the spaces and you got me. We’ll walk some road together. If you don’t like me, find someone else! We’re in this together. For some, there are days that are hard earned, when holding on takes every bit of faith and hope… celebrate the victory! Luka Bloom celebrates that in his song, You Survive. and for our veterans… Veterans Crisis Line. This entry was posted in Depression and tagged Community, depression, God, grace. November 21: Civility transcends us and them. It might be easy when reading the scriptures to fall into an us and them attitude when thinking of how we ought to behave, speak and act. 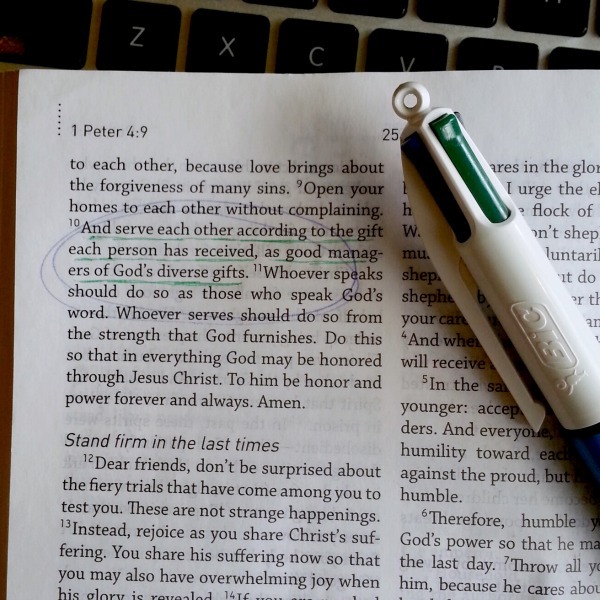 The scriptural writers, especially when we’re reading Paul, Peter and James, are very concerned with helping a new community in it’s formative first generation. This leads to a lot of us language, but it doesn’t have to be to the exclusion of them. Us and them thinking can lead us to disparaging them and us defaming them, us devaluing them and us disenfranchising them. That is not our calling. God’s grace, as it is lived and shared, and as it forgives and builds up, is not just for Christians to lavish on Christians. When we speak to someone who is not a person of our faith we do not do so with distaste, condescension or incivility. Their dignity remains intact and it is part of our responsibility to recognize and defend it. We should speak to anyone who may be “outside” as we speak to anyone who may be “inside.” We speak with grace, seasoning our speech for the well-being of the listener. 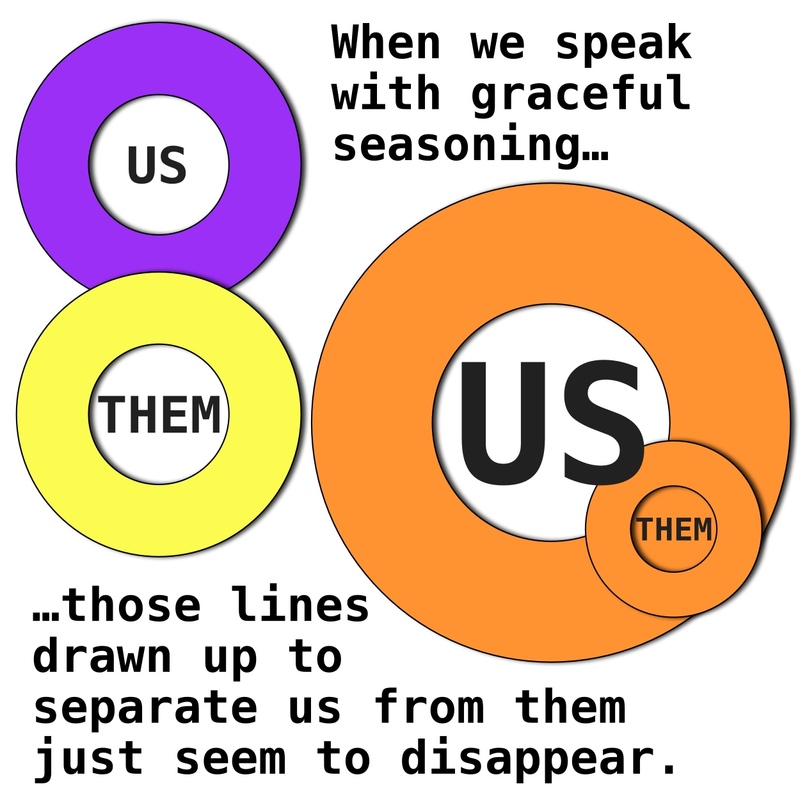 When we speak with graceful seasoning those lines drawn up to separate us from them just seem to disappear. My favorite example of this kind of grace is found in Acts 17:16-34 when Paul speaks to the people in Athens, Greece. At the time Paul sees a lot of idolatry, the idols lined up in the city are very real, very immediate. This disturbs Paul’s soul and he wants to share the message of Christ with the people, so he begins his address in the Areopagus (Town Hall) by complimenting them. Whoa, what? Yes, he starts by affirming their religious devotion and the thorough nature of their religious practice. He quotes their own poets to affirm all people’s place as God’s children. See how he speaks a blend of us and them? He recognizes an “us” aspect with his hearers. With this kind of foundation he unpacks his message. All the people won’t believe him, but they sure heard him. He delivered his message seasoned with grace. And it’s no wonder that our verse today is from his letter to the Colossians. How many times today do we see Christians rationalizing their way into beginning their gospel presentation with some form of, “How’s that road to hell going for ya, sinner?” or some other form of turn or burn harness that begins with stripping a perceived outsider of dignity and respect? When feelings of condescension rise up in me I must renounce them and find a new footing. When my conversation becomes animated by distaste instead of grace I must stop and change my heart. When my speech is flavored by bitterness it’s not what my hearer needs. When I’m loving us and not loving them I’m playing the wrong game all together. This entry was posted in Civility, Devotional Thoughts and tagged Civility, grace, Seasoning, Us and Them.